Alice was a wonderful woman. 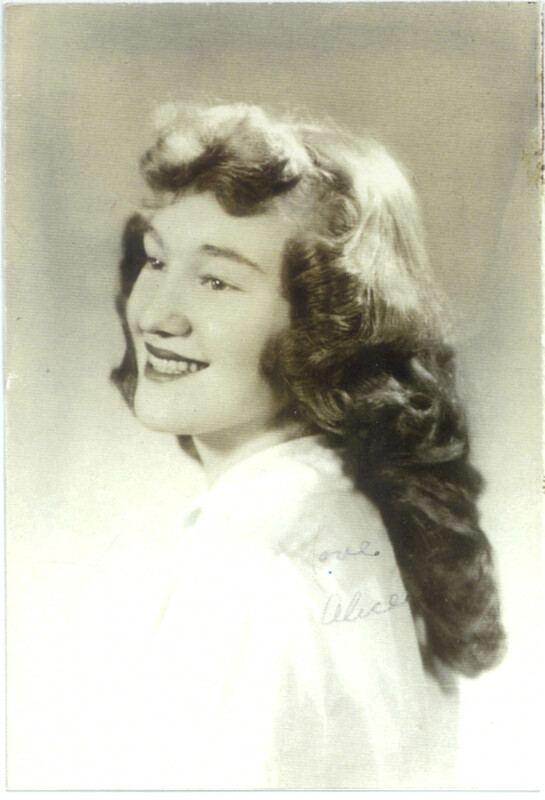 She was my father’s mother, and she had the kindest heart and soul. She would have gladly given the clothes off her back to help someone in need. She met my grandfather, Jerry, in 1951 on a blind date. At the time, she was training to become a nurse, and he had just been drafted in the army and was sent to Indiana. He wrote Alice many letters, one of which was addressed to Alice’s parents asking their permission to marry her. Through this correspondence, they planned a wedding and when he returned home, they got married in 1952. Alice and Jerry were married for over 53 years when Alice passed away from an aggressive form of Lupis. A few years later, Jerry followed her. 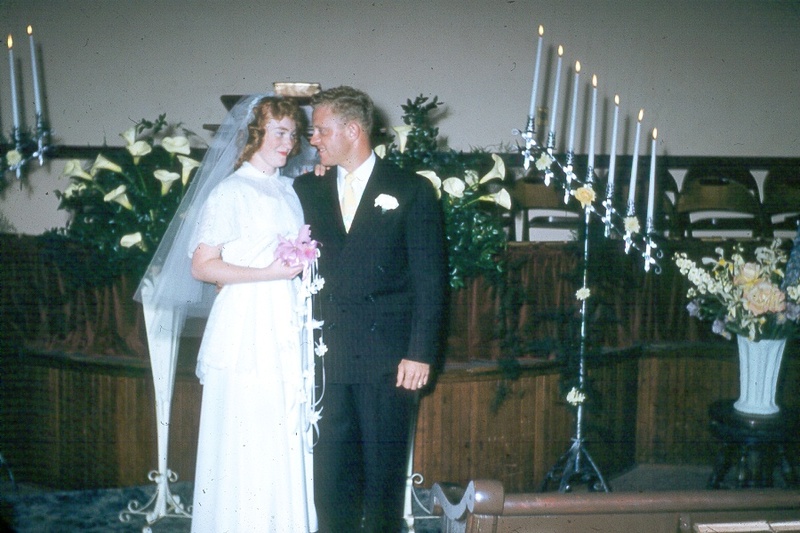 After they were married, they lived with Jerry’s parents for a while before moving into University housing and then to a rental house near the site of their future home that was being built. After their third child was born, they moved into their new home and spent the rest of their lives together in, what the family calls, the red house (due to the paint color). Now that they are gone, the family is left to go through memories and reminisce of times past. 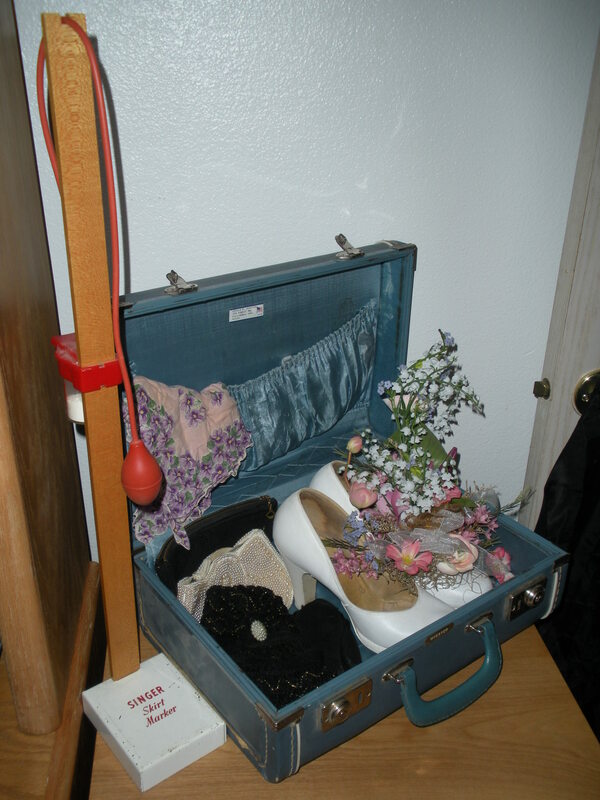 While going through some of my grandmother’s things, they found this suitcase and some of the following: 2 evening clutches, 2 hats, and one handkerchief which is thought to have belonged to Alice’s mother before her. Along with these, a Singer Dress Marker, and a black cocktail dress with a matching belt were found. When they celebrated their 50th wedding anniversary, their original wedding attire was put on dressforms and displayed for guests. 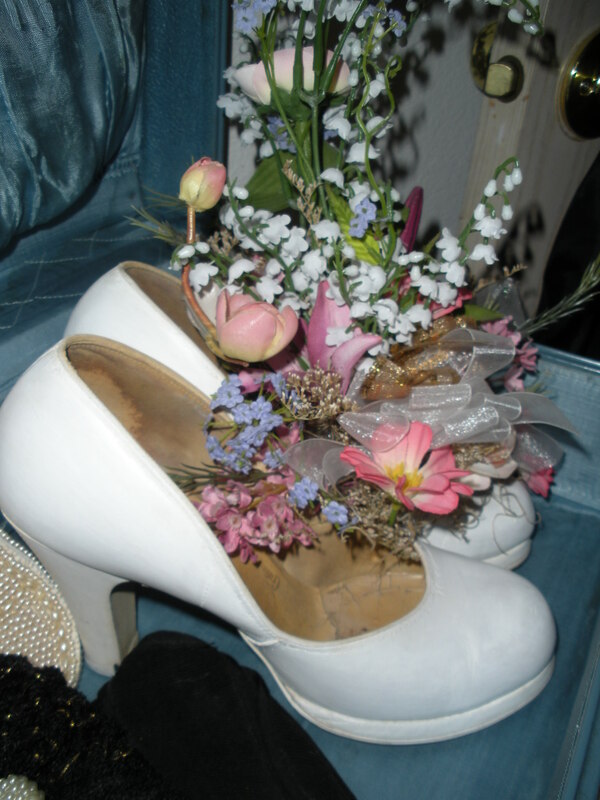 Below my grandmother’s wedding dress were her shoes, which were turned into a silk flower arrangement. I have those shoes now, and every time I look at them, I am reminded of the day she wore them, and how excited and happy she must have been. As I was looking around at some sewing blogs online, I saw a Crinoline tutorial from Gertie. I loved this idea so much that I decided to make one, even though I don’t have any skirts or dresses to wear it with. . .yet. My goal is to make a dress, or a few, to wear instead of my norm, jeans and a sweatshirt. The materials cost me around $13.00 total, not bad for a handmade undergarment. I took my measurements, and cut two rectangles. The width was the widest part of my body, (the hips), and the length was where I wanted to actual ‘slip’ part to come to, I used Gertie’s measurement of about 12″. I added a few too many inches, thinking that I would be allowing adequate room in the hips if I didn’t want the slip part to be skin tight. After sewing in the elastic, I discovered that the waist was too large, so I had to safety pin a pleat into the front. I will be making another crinoline, but will definitely be making a few adjustments so that it fits correctly at the waist. I have a short torso, so it makes it difficult to find clothing and sew patterns that fit correctly. I’m still trying to figure out how to tailor them to my size. Here are a few pictures of the slip in progress, and by progress I mean I still have one layer of organza to sew to the bottom. It turned out well so far. I figured these pictures weren’t too risque to show. I even dressed it up with some heels! ^_^ Enjoy. Added a pink bow made out of stitched ribbon at the top of the pleat. Still have one more layer of organza to go. . . 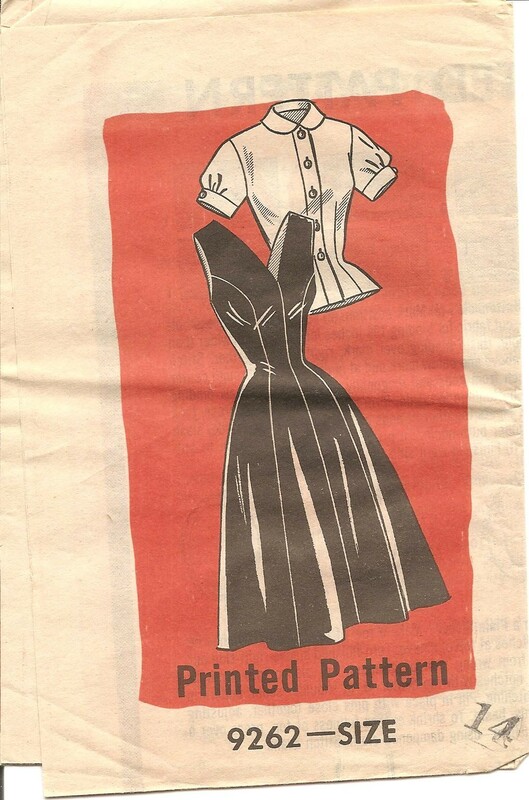 Along with the other patterns in my grandmother’s stash, I found several of these patterns published by The American Weekly. They were mailed to her. 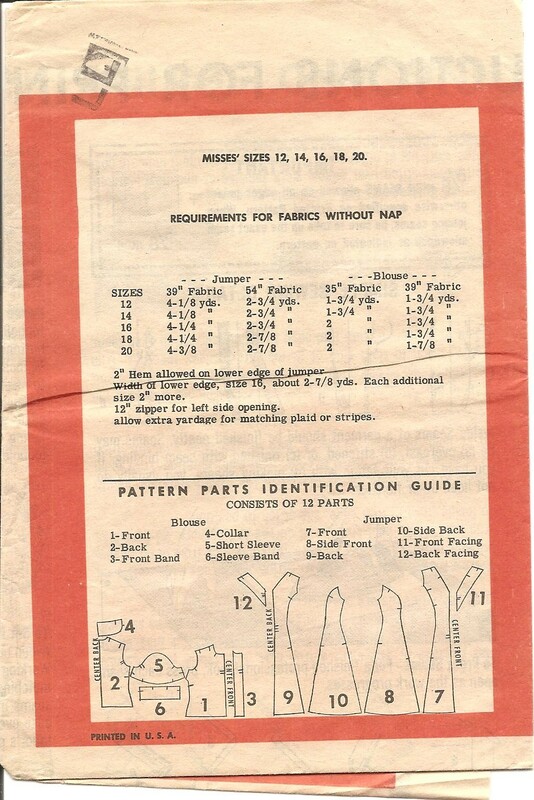 According to this website, the information in the metered postage says that this pattern is from the 1950’s, but no specific year was given. It seems that a popular way for homemakers to order patterns back then was through mail orders in magazines. Other popular designers of the era included Marian Martin and Anne Adams. There really aren’t that many great pattern history websites out there, this is the only one I was able to dig up so far, but I’ll keep looking. 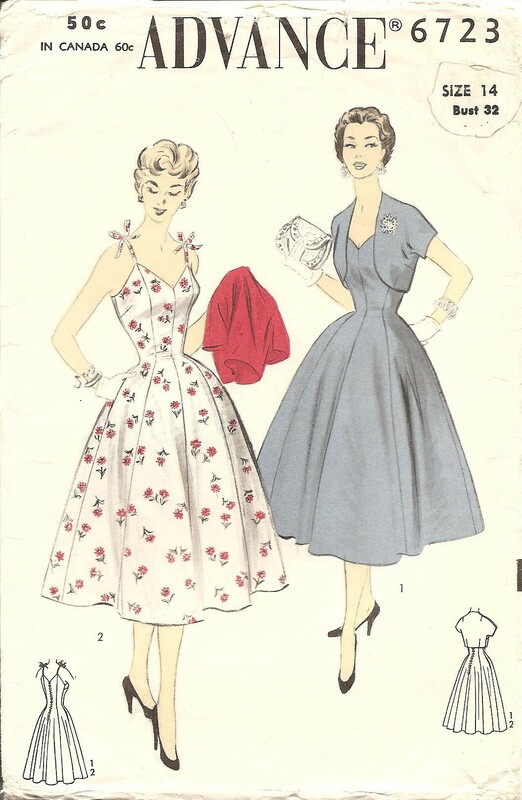 If you have a favorite place to get info on old patterns, please leave me a comment and let me know! Now, onto the pattern. Not much information given on pattern. No description of garments. A total of 12 printed pattern pieces, 6 for the blouse and 6 for the jumper. 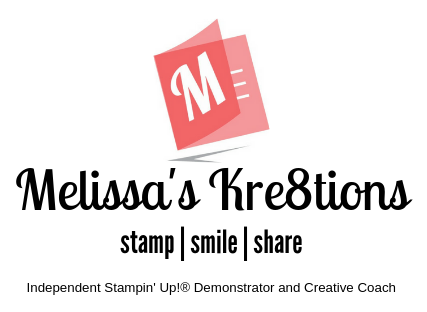 Only information really given introduces “new improved printed pattern.” Postage on envelope says 1 1/2 cents. . .but no date. Pattern belonged to a Carol Kurilo and seemed to have been leant to Alice. Above “American Weekly” on envelope, it reads, “contents-merchandise postmaster: this parcel may be opened for postal inspection if necessary, return poatage guaranteed.” And yes, poatage was typed on the envelope. Copyright: Unknown – Early 50’s? -Wide sweep to flare at hemline. (View 1) Dress and Bolero-All one fabric. Another gorgeous dress! 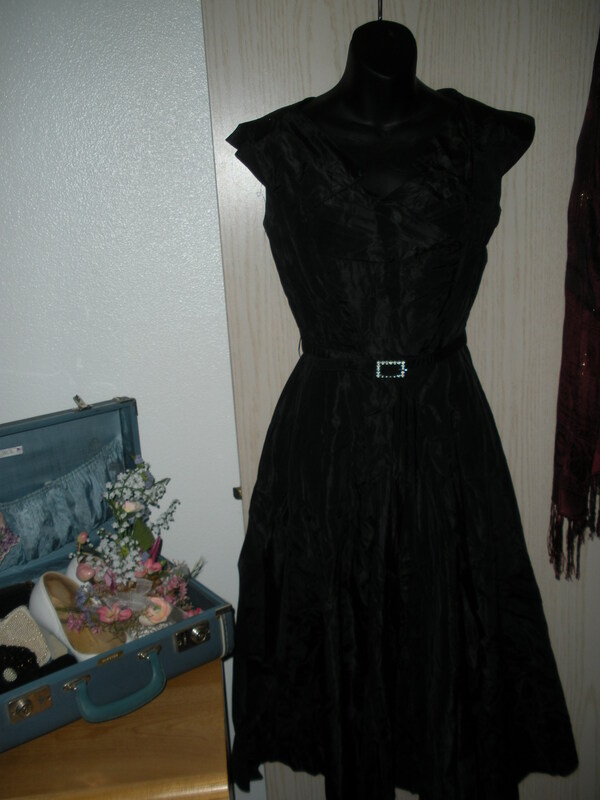 This one is a sundress with a bolero jacket. Perfect for a day on the town without the bolero or a social gathering or evening engagement with the bolero. I adore the shape this dress gives, the full skirt and fitted bodice. Notice again, the white gloves. Boy, I’m glad I picked mine up at that vintage booth for $5! ^_^ I still have yet to score some vintage shoes that fit. Some pictures that will be coming soon are: My grandmother’s vintage wedding shoes, a Singer Skirt Marker, a few hats and clutches, a vintage suitcase, and a vintage black cocktail dress! All of these were in my grandmother’s possession, but I believe that some of them may have belonged to her mother. I picked out a few pieces from my wish list that I would think go rather well together. What do you think?